Northwest Washington's Skagit Valley comes alive with brilliant color each spring. Acres and acres of daffodils, tulips, and irises entice visitors to the towns of La Conner and Mount Vernon. They come to take in the pastoral beauty, and to enjoy the annual festivities. The flower-viewing season begins with dainty yellow daffodils in mid- to late March, a rainbow of tulips takes the stage in April, and irises and lilies follow, providing color well into the month of May. The Skagit Valley Tulip Festival celebrates this annual burst of spring color. Mother Nature decides exactly when the display of color begins, with special events scheduled throughout the month of April. Options for viewing the blooming flower fields during Skagit Valley Tulip Festival time include driving, walking, biking, and tour buses or shuttles. Most of the flower fields are found on the west side of Interstate 5, between Fir Island Road (Exit 221) and Josh Wilson Road (Exit 231). During peak viewing time the roads through the blooming fields can become congested, particularly on weekends. Tulip Country Bike Tours: These guided bike tours include your bike, a helmet, a garden tour, lunch, and stops at great tulip-viewing spots. Helicopter Tours: Get an aerial view of the colorful flower fields, the entire Skagit Valley, and the surrounding mountains, islands, and waters. Check out the official Skagit Valley Tulip Festival website for the most current list of tours and transportation available. Visit the official website for the full list of events which includes art shows at several different venues, tastings at local wineries and breweries, and much, much more. 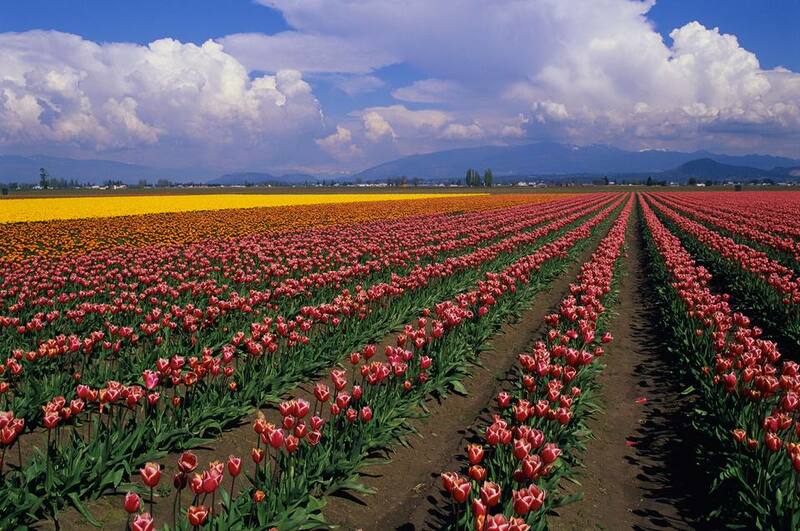 While spring is clearly a popular time to visit, Skagit Valley is a great getaway all year round. The fertile valley and water views inspire many artists, giving rise to a number of shops and galleries. Located only an hour north of Seattle, the rural panoramas provide a convenient and relaxing escape from city life.